It was Otis’s birthday last week and I completely let it go by without mentioning it here. So…happy belated birthday, Otie! Yes, that’s a band-aid on his ear. He tangled with a thorn bush on an afternoon walk last week and, to hear Gil tell it, the whole thing looked like a horror show with blood everywhere, even on Rufus. At least one tiny bandage took care of everything. If you haven’t heard, April is Adopt a Greyhound month. I’m clearly biased, but I think they’re just incredible animals; I don’t think we’ll ever not have one cockroached at the foot of our bed. 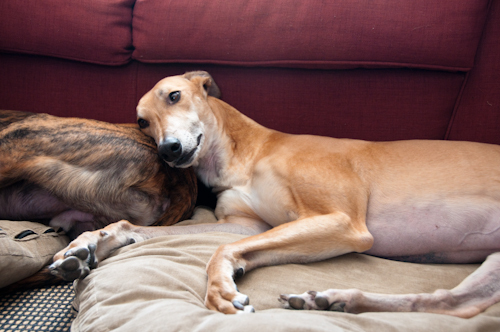 If you think you might like to rescue a former racer (and are in NJ), I highly recommend Greyhound Friends of New Jersey — they’ve been a wonderful resource. Animated Otis, for your viewing pleasure. Food post coming tomorrow, promise.